The 3DS may be entering its twilight years but that doesn't mean that DSiWare - the downloadable software service which launched with the 3DS console's forerunner, the DSi - is completely dead. In fact, thanks to the large helping of DSiWare games in this week's Download Update, there are now 604 games and apps available for DSiWare. That's quite an amazing figure considering DSiWare's limitations and the fact that it has long since been surpassed by the 3DS's own downloadable delights. 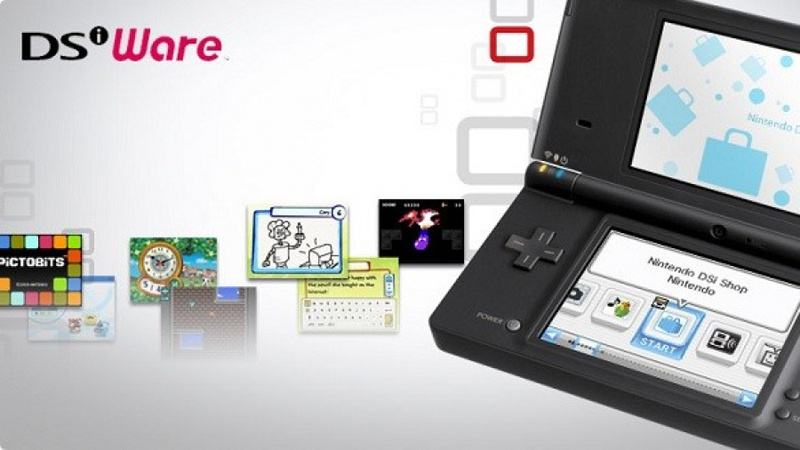 DSiWare launched alongside the DSi console, which was the final hardware revision of the Nintendo DS system, capable of connecting to the internet and downloading applications. 604? Only Ten good ones really! And the best one is Pictobits! There were a handful of gems on the service (such as Shantae and X-Scape), but sadly the majority of that number was between mediocre to shovelware. There absolutely were quite a few DSiWare that I loved, such as Shantae, many Art Style entries, some Popcap games, but it never really quite hit its stride like the eShop did. With the advent of 3DS eShop, its download titles accomplished so much more in terms of content and quality, my 3DS eShop collection far outweighs my DSiWare collection. 600+ DSiWare games and apps, and not a single text editor. Wish they were on sale every now and then, there are a bunch of DSi Ware games I want to play but can't stomach the price. @davidevoid I think it's that Nintendo has since locked the pricing (which was based in fixed tiers of Nintendo Points). When WayForward had their anniversary sale, they claimed something along those lines for why Shantae:RR (and, in a similar boat, Mighty Milky Way and Mighty Flip Champs!) weren't included. There's a lot of trash in there, but sometimes there's a real gem to be found. I hear the Shantae sequel is really good. I also thought the Rayman port was well done despite what NintendoLife said. My thoughts exactly. Never bothered to buy a DSi so I'm glad the games are available on 3DS. Text editor? Do you mean like Nnooo's MyNotebook application or something else? The part that get's me about DSiWare is that the games NEVER go on sale or are discounted. I know it's stemming from the extremely non-robust system that ran/runs both WiiWare and DSiWare (or just Nintendo not giving a care). Their prices are insane to not be lower especially since the eShop is a complete successor to the DSiWare, and some of those games are what, 4, 5 years old? I always wanted to get Mighty Flip Champs and Mighty Milky Way before I tried Mighty Switch Force, but at this rate, I'll let those fall into obscurity and pick up with MSF. Last thing I'll say is Nintendo ought to en masse add the WiiWare/DSiWare libraries to the eShops and kill off those limited, pointless, tripe "shops", but I don't call the shots. @Rensch Nail on the head with the 'trash' part. @MeloMan I mean text editor, like Notepad in Windows. The Nnooo stuff is more like Game Notes or Flipnote Studio. It's pretty sad when some of the best games on the Dsiware were the free stuff like Flipnote and Four Swords. Photo Dojo was an awesome free game too, though you have to pay for it now if you didn't get it at launch. Anything by Q-games was good and there were a few other gems, but this was generally a pretty hit or miss service. Thats a lot of games for a system that should not really be released. I'm still trying to figure out why everyone made the mistake that Iwata-san saying that the DSi had double CPU. In the end not one of these titles shows something that the DS CPU's can't do. Still nothing in Australia, though. We never even got the second Shantae! It helps a lot that 3DS eshop allows to buy all DSiware catalog. (Learn from that Wii U). That's pretty cool...never forget the past! I'll even throw in Aura-Aura Climber even though I haven't touched it beyond maybe an hour of time put into it.